We are running a free prize draw to win a £25 voucher to spend with us, either at a fair or on our website. All you need to do is request to join our mailing list. Email us at info@flutterbyonline.co.uk and we shall enter you in the draw which we’ll do on Sunday 6th December at 1pm. All the names will go into a hat and the lucky winner will be notified by email. So why not join the Flutterby Friends and then you could do some of your Christmas shopping with a little extra present from us? Or perhaps you could treat yourself to a present? What about one of our Tina bracelets? 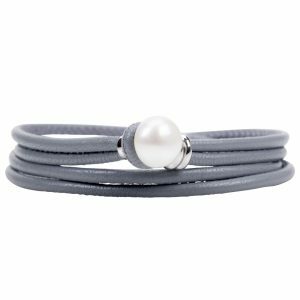 These leather magnetic bracelets are made with lovely soft top quality leather and finished with attractive silver coloured studs. They’re super cool and so easy to wear… either on their own or with other bracelets. They even look good in twos! They’ve been selling very well at all the shows and make a perfect Christmas gift this year. Everything purchased from our website is beautifully packaged in a box with ribbon… all ready to give so helping with all the jobs we all have to do as the busiest time of year approaches. Oh yes…. I’ll just add that we don’t pester those clients on our mailing list with endless emails. We’ll only contact you when we’ve got something really interesting to say… like a ticket give away (for shows like Spirit of Christmas) or a fabulous offer. We know how annoying it is to have your inbox cluttered up with the same companies emailing every few days … so we don’t do it. 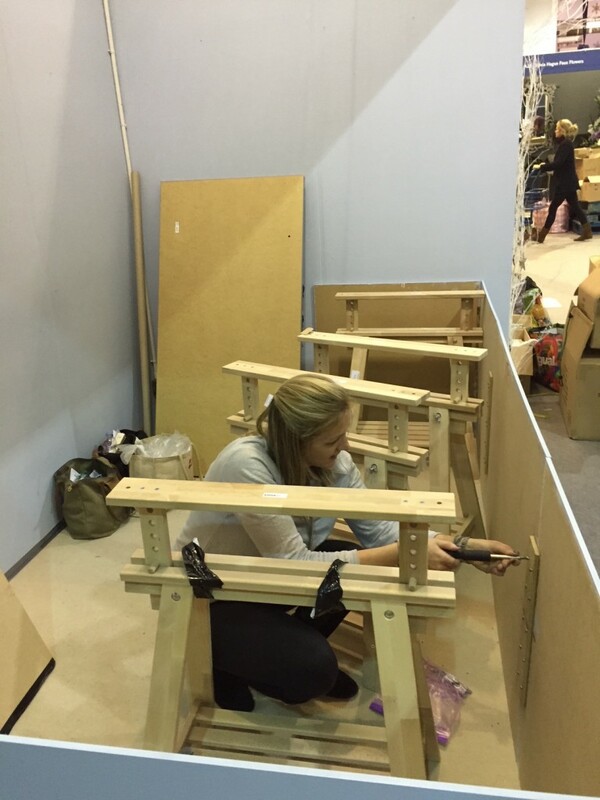 Have you ever wondered how all those amazing stands at big Christmas gift show are made? The stands last week at Spirit of Christmas looked fabulous! The Grand Hall at Olympia was turned into a beautiful collection of boutiques where many thousands of shoppers came to do their shopping and enjoy a wonderful day. As I am sure you’ll appreciate, these stands take many days and hours to create. 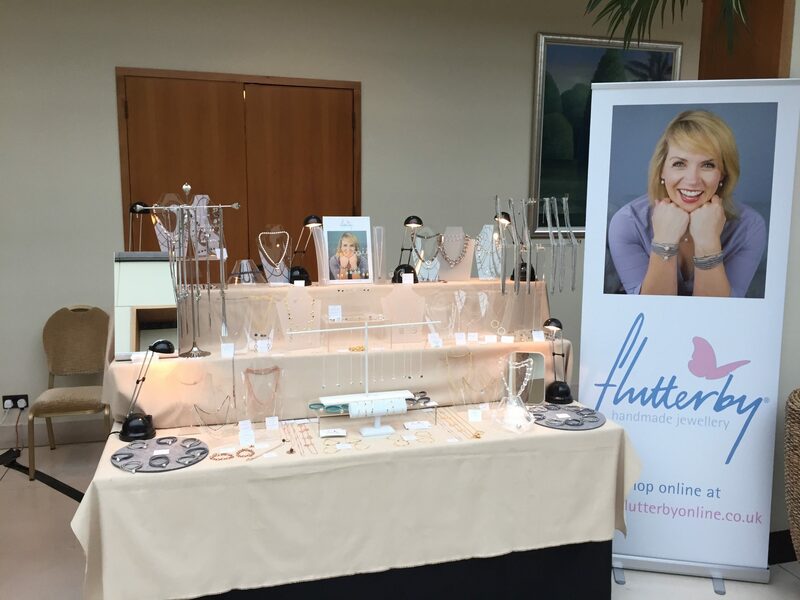 Speaking for ourselves at Flutterby, there was an enormous amount of planning involved to make our stand look a little different this year but still allow us to display our jewellery to our customers. Lots of graph paper, MDF and paint charts! Not forgetting the marshmallows, ever-handy staple gun and incredible DIY expert we had to help us. Yesterday, once the last visitor had left, breakdown began and Olympia sprang into action of a different kind, with a sea of exhibitors dismantling their carefully-constructed stands, pilling everything into vans and trying to get home through the traffic. Perhaps it is the less glamorous side to designing and selling jewellery! A busy week, and a happy week with some fabulous neighbouring exhibitors with whom to we had a laugh and now it is onto the next show…… Mustn’t forget the marshmallows and the tree! 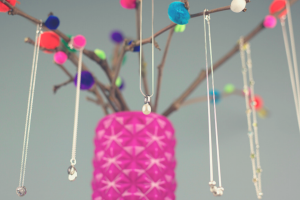 Looking forward to Spirit of Christmas next week, 2-8 November, we are busy designing beautiful handmade jewellery. We really enjoy creating original wearable and also affordable handmade jewellery. We all have lots of presents to buy at Christmas time so we offer our customers something pretty, special and stylish… a gift that will delight the recipient as well as those who give at a great price! Jewellery that you know is so easy to wear that the person you give it is bound to enjoy it. This year we have a wide range of new pieces on show … our long necklaces, as well as fabulous leather bracelets… Our new sterling silver Coco bracelets are only £15 each and they are selling so well you’d better come quickly! We shall be offering some Spirit Specials too! Come and see us at stand A33 – which is in the loop of stands to the left as you come into the ground floor of Olympia. 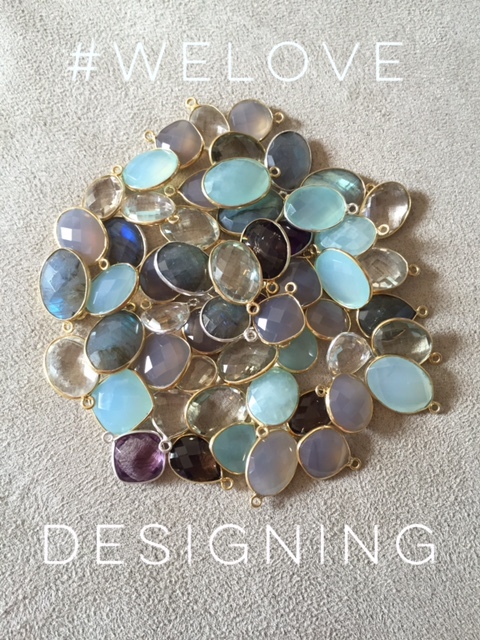 The gorgeous stone pendants in this photo are beautiful faceted stones; labradorite, chalcedony and crystal to name but a few. The way we have incorporated them into our new Letty range is so that you can enjoy wearing them singly or alongside other gold plated charms. 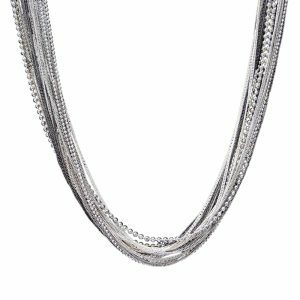 We have a range of lengths of chains and different charms for you to choose from. Prices will start at £45. Amazing value for a sterling silver and gold plated necklace. 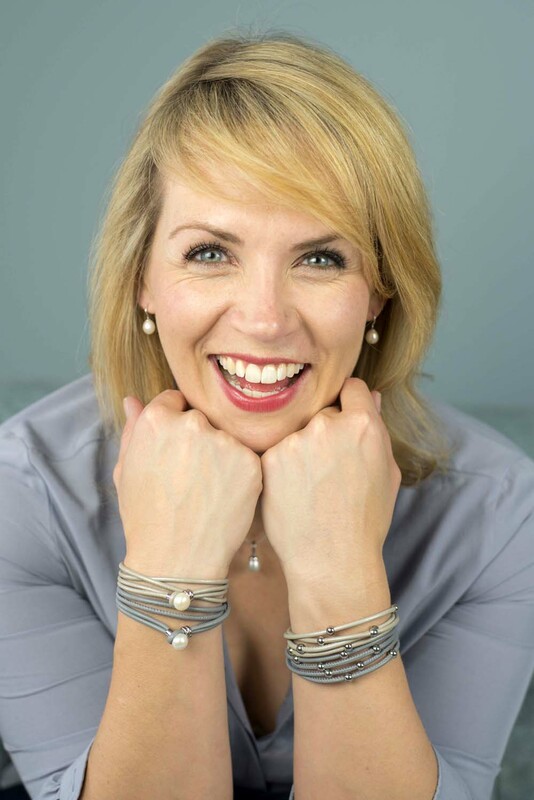 So come and see us next week and say ‘hi’ – come and browse the pearl and leather bracelets, our new Tina bracelets, our necklaces and a gorgeous range of new earrings too… as well as being the first to see our new Letty gold collection. We love making handmade jewellery and we love offering you great value this Christmas! Only 6 weeks to go and Olympia will be transformed into a wonderful Christmas shopping mall! 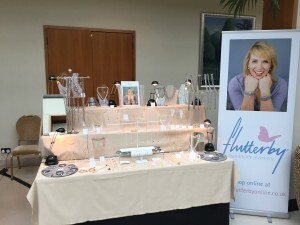 Yes, we are off to Spirit of Christmas once again and, here at Flutterby, we are busy designing our stand and working out how to make it even more special than last year. We shall be in the same spot as last year – A33 – so that is towards the lefthand side of the hall as you come in. However, before all of that, we are starting our charity fairs with the Charity Fair at Whittlebury Park near Towcester tomorrow. It will be the first opportunity for us to show off our new collection. We always wonder whether we should simplify things and reduce the number of products that we sell but …yes, you’ve guessed it… once again we haven’t managed it! Just too many pretty stones and ideas to include. So standby for a wide range of new and beautiful pieces! We have a wonderful range of new earrings to show you, lots of new bracelets and, of course, so many new necklaces, both long and short, that we are going to display this season. Our prices will range from £10 to around £300… with the aim of making Christmas shopping easy, rewarding, good value…..and beautifully wrapped! We are going to put more and more pieces up on our website over the next few weeks so please keep an eye out for them. Why not join our mailing list for details of competitions, new offers and the chance to win tickets to Spirit of Christmas 2015? Back to school… and off to the fairs! Although it has stopped raining at the moment, I am sure I am not the only one who feels that summer has ended and that we are already well into autumn. With the children back at school, here at Flutterby we are preparing for the busy programme of charity and other fairs that we will be going to over the next few months. The charity fairs are a fantastic way that the charities help to raise money. Stallholders pay for their stands and then usually give at least 10% of their takings to the charity. We love supporting these events… besides, it takes a huge amount of hard work by all the committees involved to organise these events and they do a great job. Our first charity fair is the Whittlebury Charity fair (www.whittleburycharityfair.co.uk) on Wednesday 23rd and Thursday 24th September. We’ve never been to this one before so are very excited. We shall be bringing a wide selection of new stock! Loads of new necklaces and so many new bracelets that we can’t decide which to take … so we’ll just have to bring everything! Look out for some new photos in the next few weeks as we’ll put up some of our new designs. 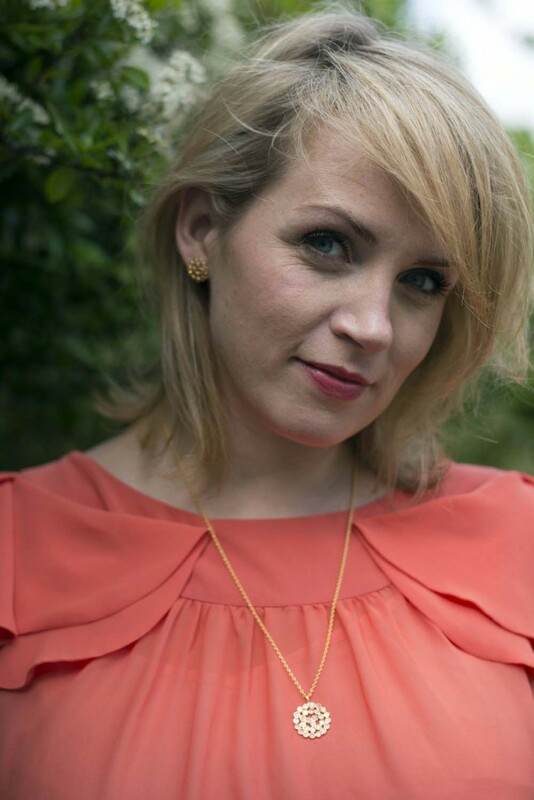 This is Sarah wearing our Daisy necklace and earring set. When taking all the photos for our new website we nipped outside between the showers to take the photo in the garden as it seemed appropriate! The pendant is made with crystal set in beautiful gold plate. This is echoed in the design of the stud earrings. 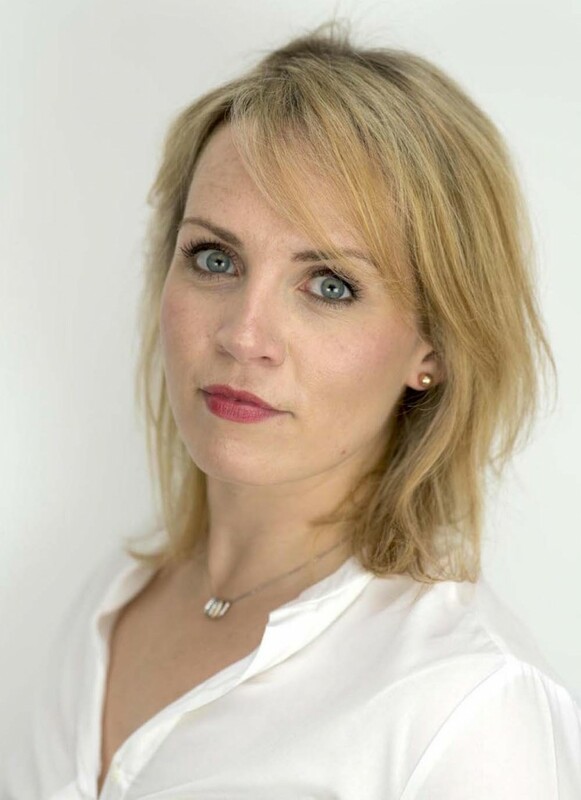 I wear my Daisy gold studs much of the time as I love the shape they make on the ear, as well as the look of the clear stone and the gold which tones with so many of the pieces in my jewellery collection without being too dominant… they are really pretty! The gold plated pendant is hung on a mid-length chain which makes it a little different from the usual long or short necklaces usually available. Don’t worry though, should you wish to hang it on a different chain of your own you could. Sarah is wearing it here with an orange top with a casual day-time look but this set works brilliantly for day and evening and works with a variety of necklines as well, of course, as with numerous colourways. Hope you like it! So as August arrives might it be time to head to the beautiful British seaside? 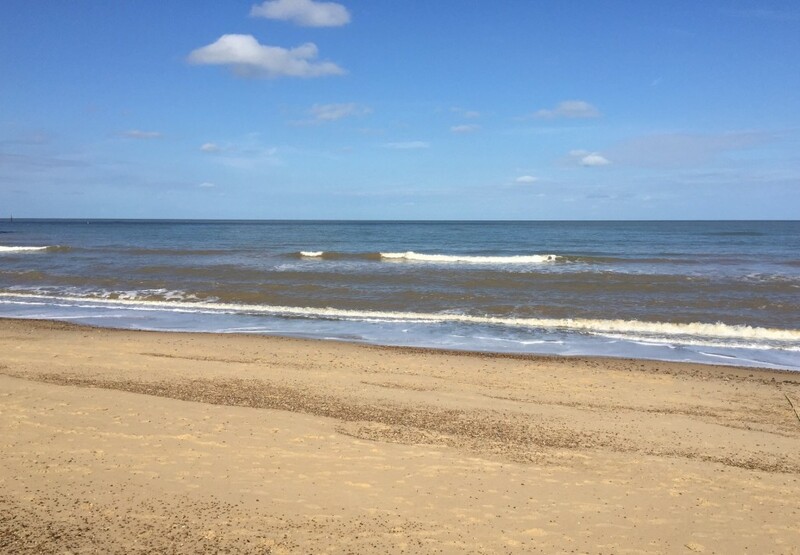 Sitting by the beach, or maybe enjoying a plate of fresh seafood at one of the lovely pubs and restaurants that we have in the UK, is one of the traditional parts of the summer holidays in my family. Whether it be a day for a game of beach cricket or just walking along by sea we all want to look fabulous. We don’t just need poolside jewellery but also beachside jewellery too! We love our best-selling pearl and leather bracelets either worn singularly or two together. 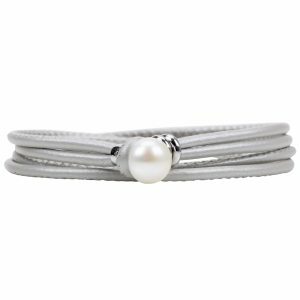 Perfect for an busy, active day as they are just so easy to wear… We all love leather bracelets and ours wrap around the wrist twice and are fastened by looping the leather around the pretty pearl. We sell them in two colourways: oyster and grey. Sometimes, we all need practical jewellery that will fit into our busy lives – at the beach or in the office. We have both worn our bracelets loads and can vouch for the quality and durability… although please take them off before jumping into the water…!